Hot, hot summers have started and its time to upgrade our skincare routine as well as our diet routine. While we change our diet to include more chilled drinks like buttermilk, coconut water, fresh juices, etc. our skincare routine must also change to include light gel based creams, deep cleansing face washes and clay masks. Today am here to review one such clay mask from the popular brand Plum. Plum products have gained a lot of attention nowadays as they are free from parabens, phthalates, propylene glycol, SLS, DEA and PABA. 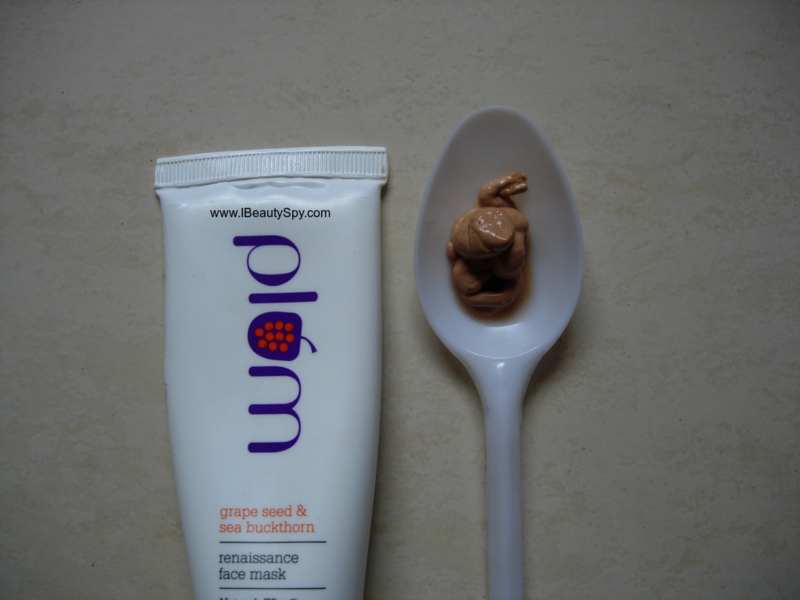 In this post, I will be reviewing Plum Grape Seed and Sea Buckthorn Renaissance Face Mask. Read on to know whether its worth a buy this summers or not. * Kaolin & Bentonite Clays for cleansing and exfoliation. I got this mask mainly on reading the first line in the product claims. Berry mask! I expected it to be a fruity mask 😅. But to my disappointment, it turned out to be a regular clay mask. Plum Grape Seed and Sea Buckthorn Renaissance Face Mask is brown in color just like a regular clay mask. The consistency is thick and creamy. The fragrance is very mild, though its not a natural fragrance from the ingredients, but an added fragrance. I wash and scrub my face and then apply a thick layer of this face mask. On applying, it tingles very mildly for a few seconds. But don’t worry, the tingling sensation is very mild. So even sensitive skin people can use it. I keep the mask on for 20 minutes and then wash off. Plum Grape Seed and Sea Buckthorn Renaissance Face Mask doesn’t dry and harden up unlike other clay masks. Due to the presence of oils, it doesn’t make face stretchy. After washing, skin feels clean, smooth and soft. It pulls out all the impurities, dirt, grime and clears clogged pores without making skin dry. The mask contains grape seed oil which is rich in antioxidants and regular use can help prevent aging skin. So coming to the final question! 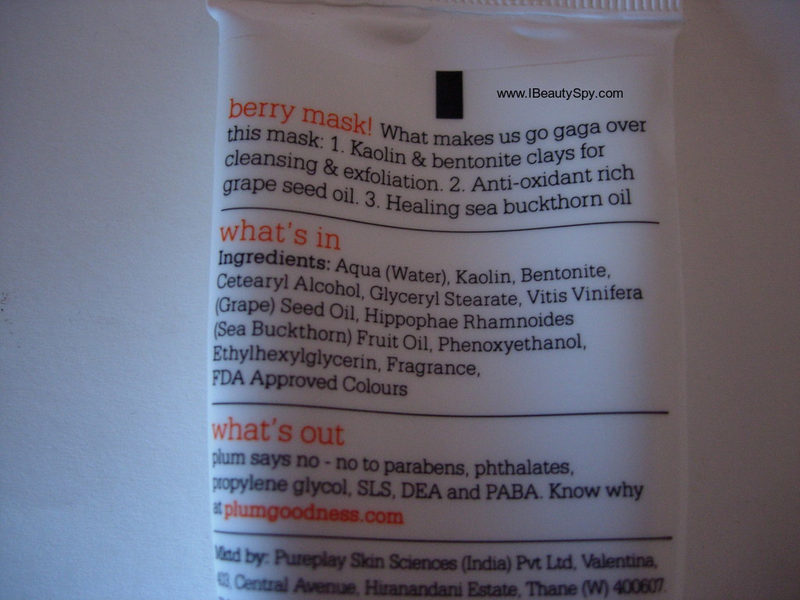 Is Plum Grape Seed and Sea Buckthorn Renaissance Face Mask worth a buy or not? Personally I find it just like a regular clay mask with added benefit of grape seed oil. You can make it easily at home using kaolin, bentonite clay and grape seed oil at a fraction of this price. But if you are not much into DIYs and looking for a good quality face mask without added parabens and phthalates, then you can give this a try. 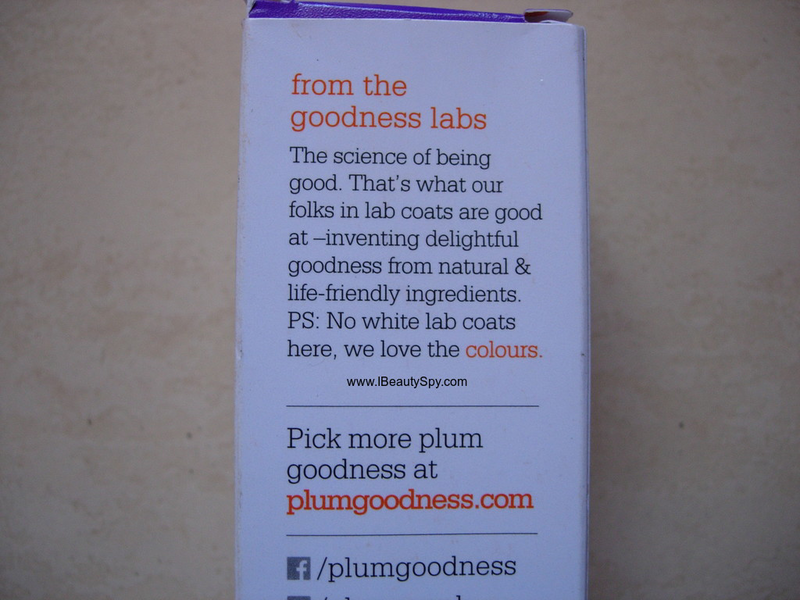 Also, unlike other natural brands, Plum is open and transparent about their ingredients. I love the fact that they have a minimal ingredients list unlike some other brands where there are a huge list of chemicals. Kaolin & Bentonite Clays help in cleansing and exfoliation. Grape seed oil is rich in anti-oxidants and help to fight aging, restore collagen and reduce scars. Sea buckthorn fruit oil is rich in nutrients like carotenoids, beta-carotene, anti-oxidants and vitamins A,C, E which helps to heal rough skin and prevent aging of skin. Ethylhexylglcycerin is made from glycerin and is a skin conditioning agent. Ceteraryl alcohol and Glyceryl stearate are both emulsifying agents. Fragrance and FDA Approved colors – I wonder why they have added this 🤔. The mask could have been better without these 😕. Yes, it doesn’t make any tall claims. But satisfies whatever it claims. * Free from parabens, phthalates, propylene glycol, SLS, DEA and PABA. * Contains grape seed oil and sea buckthorn oil which are loaded with nutrients and anti-oxidants. * Gentle on the skin which makes it ideal for sensitive skin. * Deep cleanses skin and makes it smooth and soft. * Transparency in ingredients – What’s in and What’s out are mentioned. * Fragrance and colors are not needed. Yes and no. Yes, if you are bored of DIYs and looking for a quick use clay mask with added benefits of grape seed and sea buckthorn oil. No, if you find it pricey and feel you can concoct the same at home. No. It doesn’t do any miracles. Just a regular clay mask which I find is pricey. I find it pricey considering the fact that it doesn’t do anything major except like a regular clay mask, deep cleanses skin. But on the other hand, paraben and phthalates free products are generally pricey. Plum Grape Seed and Sea Buckthorn Renaissance Face Mask is a good quality clay mask which will suit all skin types, even sensitive skin. If you don’t find it pricey, you can give it a try. But I feel it doesn’t do anything more like removing tan or adding glow and hence can’t justify the price. So that’s about it! Have you used Plum Grape Seed and Sea Buckthorn Renaissance Face Mask? Do share your experience in the comments below. Honest detailing as well. I absolutely agree with you that some brands nowadays don’t give much info about the products what they should. Coming to the product it seems nice. I haven’t used any Plum product yet, though wish to try. Thanks for sharing. As always… Honest review 👍 I won’t buy it bcoz it’s pricey and not a great product as well.